"Please write in this book", Debbie Travis advises. "This is your handbook, both practical and personal. Fill in the blanks, tick the boxes, circle the words and write the truth to yourself." And "the truth" is exactly what Debbie Travis wants you to find in your own life. She shares lessons she's learned along the way, sprinkled with uplifting stories others have shared with her. If you are looking for decorating ideas from this book, please turn the page. This is definitely not what Design your Next Chapter is about. 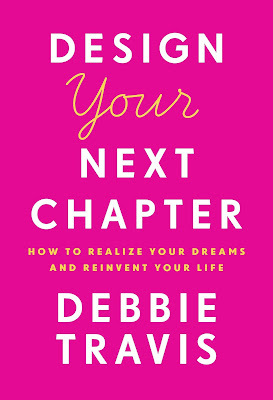 Debbie Travis insists that it's a book for those who have reached a point in their life where they are unhappy, and are looking to change the course of their current journey. It's supposed to inspire those who are stuck or feel blocked in their daily routine. Who feel uninspired in how they are living day in and day out. What if you have the courage to come to a full stop, take a look around, and then map out the journey to a completely new path? Design Your Next Chapter is about stories. Some of those Debbie Travis draws from her own life, and others from people she's met along the way. I was very curious to know where the spark came from for her Tuscan adventure, and how she got about putting a plan into action in making her dreams a reality. Full disclosure: when I heard about this year's ago when she was on the Marilyn Denis Show, I was so intrigued about the possibility of someday venturing out to do something like that myself. A pipe dream? Or something that was achievable? I wanted Design Your Next Chapter to give me all the answers. But it didn't give me all the answers. It gave me nuggets of inspiration. Nothing new that I had not come across on my own before. Follow your Dreams. Don't be afraid. For those who are interested, at the end of this post are Debbie Travis' Ten Commandments. Many people just don't have the time or the luxury to just quit their jobs and follow their hearts. There are bills to be paid and people counting on you. We are generally just "too busy" looking after our families, and reacting to life's daily doses of reality. When do we really have the time to pause and think about what makes us happy? Like every other self help guru, Debbie Travis says that we do have to do just that. Pause. Reflect. Identify what makes us truly happy. Then, figure out some way to make it happen. What makes you happy doesn't have to be restoring a villa in Tuscany (although that would be absolutely amazing in my case). It can be something as simple as I want to paint more, or spend time more time with my loved ones. It's been said before, and Debbie Travis is saying it again. We just don't take the time to invest in ourselves. We don't make time for things we don't want to do. Sometimes we know what that is. Sometimes we don't. Design Your Next Chapter helps give you a nudge, reminding you to focus on what's really important: your happiness. Whether it's picking up a paintbrush, or figuring out how to make that dream of being an astronaut come true, the answer is not just to go ahead and do it. It's about how you grow the seed of an idea in your head and make that dream your reality. My favourite moment in the book was the advice that the monk on the plane gave Debbie Travis, when she was reflecting upon her happiest moments –spending time with her husband and her kids – but noted that she was just too busy to do more of that. "Then don't be so busy. Change your priorities, change your attitude – focus on what makes you happy before you run out of time." So simple. Yet, the idea is so profound designed to shift your mindset. It's one of the life lessons every entrepreneur, or CEO of a company, talks about. How does one find the time to for other things that are mindful and keep you grounded in the race up the corporate ladder? 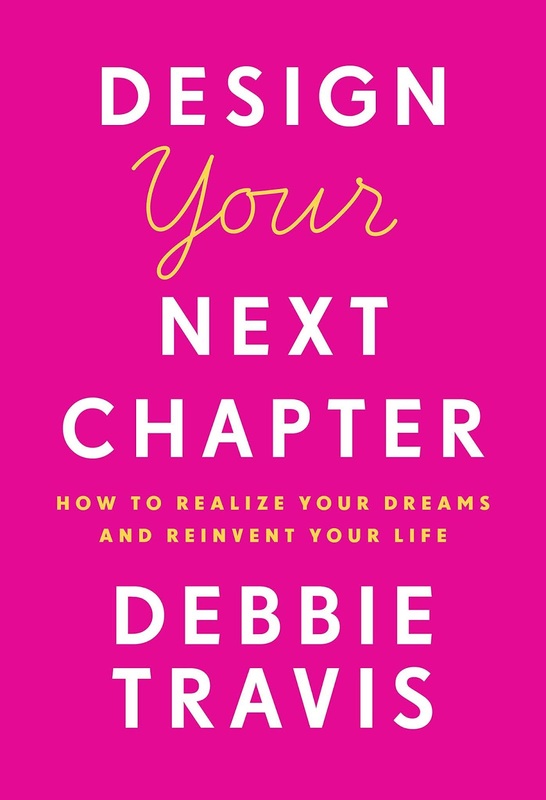 Another idea that Debbie Travis explores in Design Your Next Chapter is an exercise for people on how to find that one thing that will makes them happy. Her suggestion is to remember what made you happiest as a child. Once you transport yourself back in time, it will trigger you to moments that truly made you happy, and ignite an idea of the dream you are destined to pursue. If you are a fan of Debbie Travis, the book starts off on an upward swing, with snippets on Debbie's own life, interspersed with stories from people she has met. Some of her personal stories were new and refreshing to me. The other stories (testimonials of sorts) from people she'd met along the way, fell a bit flat. Personally, not a fan of a book that's mostly filled with testimonials and case studies. Some people are inspired by these; but I find them laborious and repetitive. I prefer a "how to" approach. I absolutely love Debbie Travis, so as a fellow creativepreneur, I was aching for more insights into how I can something work towards living my best life in a villa in Tuscany. I didn't really have the answer after reading Design Your Next Chapter, but perhaps it's reminded me of that dream. Entrepreneurship is part of my genetic makeup. I have reinvented myself into new spaces and adapted to change. I actively seek out creative zen. So, it goes without saying that I have read a lot of entrepreneurship-type books. Which is why the content in Design Your Next Chapter wasn't as revolutionary for me. But that doesn't mean it won't be for someone else. One thing for sure, that the title of the book is sassy and inspiring, and that may just be enough to get one's creative juices flowing. 2. I Mean It! Dump the Excuses. 4. Take the Right Amount of Risk. 5. Be Mindful of Your Mindset. 7. Hang on to your sense of Humour. 9. Never curb your enthusiasm. 10. Don't lose your balance. Design Your Next Chapter is published by Random House Canada. Copy provided by Penguin Random House Canada.